Laura Fontán, Galician -but with a great love towards Madrid and Vietnam-, is married, has three children and together with her husband has founded Chula, a company that not only designs and makes clothes, but that also generates and promotes a fashion culture with soul and a very special type of beauty. Laura, you have just opened a store in Madrid, in the emblematic neighborhood of Malasaña. We love your esthetics and your project, but above all, we love the beauty we see in your life, beauty that shares many aspects which we want to reflect and share at Alawa. How does a Galician end up in Vietnam setting up a venture like Chula? L: “Well, sometimes in life decisions are made without much deliberation and they take you to these opportunities. Diego –my husband- and I went to Vietnam 14 years ago to visit my brother, hoping to stay there for a year. Back then, we were young, we did not have any children or many responsibilities at work and we had always liked living abroad. So we went to my brother’s wedding in Vietnam and we fell in love with the country. We had already lived in Brazil and were eager to have another experience abroad. My brother was more than generous and even though he was a newlywed, he took us in at his beautiful and big home; we were two couples living together. We stayed there for a year -I will be grateful forever. A month after we moved in, my sister in law got pregnant, and a month later I got pregnant too, so we shared our first pregnancy. When Carmen was born, we decided to move into another house, and shortly after that, my brother and his family also changed houses. For us, however, Vietnam was like a love crush; we loved the country, the people, the food, the energy, the fabrics and the clothes-making tradition. I went with the idea of putting together something creative, a bit commercial. I had studied Politic Sciences but was specialized in International Relations. And Diego, Chula’s great artist, had studied Architecture. Diego is a “Renaissance man”, a beautiful, very special person, with many interests. He loved architecture, but wasn’t completely fulfilled, because he very much enjoyed the creative part as well. By that time, I started with my cousin from Spain, the clothing project. In Vietnam, it is customary to go to the markets and have your clothes made there, and that is how we started, playing around with that. We invested 30,000 pesetas each, -around €200- and on our first trip I started up by buying stuff in South East Asia. She set up a little store at my granny’s house, where she sold the items and with that money I bought more. I later began to make some trendy clothes myself. So you ended up discovering a passion that your husband had without him even noticing (laughs). L: Yes, because Diego has never been a fashionista, in the sense that he never really cared much about clothing. He is a creative; I loved the ideas he had, of turning everything into a more professional business and thus giving birth to Chula. We started thanks to our friends, in part. Our idea was to sell in Spain and our friends kept telling us that they wanted to buy our clothes because they like them a lot, that it was “chula” (in Spanish, this word means “cool”). We were lucky to start selling in a bag store that was very well-known there, Ipanema. We met the owners at a party, they saw the clothes, they loved them and we thought why not sell them there? We began with no plan whatsoever, investing in what we could, selling and producing on demand, in an intuitive and passionate way; we have been together since we were 19 and 21 years old and we have never considered working together before. There is a question I have been wondering about: children. You have three children, how is this life style compatible with maternity? L: “Well, Carmen, the eldest, is twelve years old, Pablo is eleven and Yago is eight. The three of them were born in Vietnam, so it was all very nice because we started a family at the same time that we started Chula. We sometimes say that Chula is like another child, the troubled one; you know how it is to start up a company, with all the inconveniences that arise and the attention it demands. At the time we organized Chula’s first fashion show, I was pregnant with Carmen. The kids see Chula as something that is also part of their lives, and have seen us work hard and treat with many different people, including disabled people and foreign people. It has been very rewarding. For a long time we lived in a house that was also a workshop, so the kids have been immersed in the whole thing, sometimes excessively, and now that they are growing up and they can see Chula and what it’s become, they are very proud. I think it is a positive thing that they can understand the struggles of building a company from scratch; even though fashion is pretty and glamorous, it is hard work and it is important that they see that. You have just brought up a subject that is very interesting, workers. They constitute a very special part of this project. Chula keeps expanding, even internationally. How has such growth been for you to the point of opening this store in the heart of Madrid? L: “It is a slow road. For nine years we were established in our headquarters and we started organizing cultural events because we wanted to promote local artists, both in culture and music. Chula became a community space, where parties, events and exhibitions were hosted. It was like a cultural encounter which the Vietnamese community, with its different nationalities, lived it as its own. For a long time we have had a close and personal bond with our workers and our customers. Then you realize that business changes. I used to like the idea of a little store in which you know all your customers, but then saw that our product and our company’s philosophy was very special due to the promotion of disabled people and local Vietnamese culture, and the idea of a global company came into picture, emphasizing the local strengths with its culture and craftworks. This is what has driven us to international borders, to take Chula through the world. On top of this, we are a very organic company: we do not have investors or credit; we invest in our company, little by little. 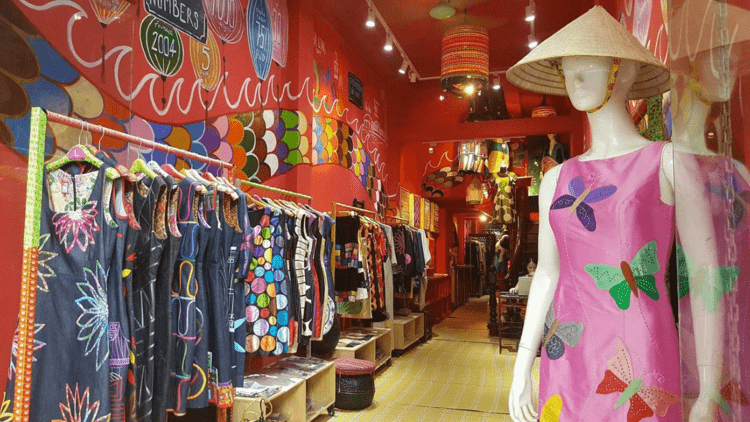 Throughout these past years, we have opened four stores in Vietnam –two in Hanoi, one in Hội An -World Heritage Site-, and one in Ho Chi Minh, commercial capital-, and a little store in Bangkok where we have a big number of customers and due to its proximity to Vietnam it’s become strategic. Madrid was a complete shocker. We opened it up this year and we are very excited about it as it is like closing a chapter and going back home. We want to develop our brand in Spain. In Vietnam we are a very well-known brand; we have been participating in the Vietnamese Fashion Week for the past seven years, being the only foreign designers; we have represented the country at fashion shows in Washington, Rome and Madrid; our first show in Madrid was thanks to Vietnam, as a celebration of international relations between both countries. We are extremely grateful to Vietnam, but now, we feel we need to make ourselves known in Spain. Studying International Relations was an omen to your current life of bringing so many cultures and countries together. Since you have mentioned it, fashion is a very unique world, based on appearance and dazzling lights. However, there is an essence; a heart behind it all, even some values that can be strong and enriching for humanity. What do you think fashion can give today’s women as “truthful” and “eternal”? L: At Chula, what we like the most is that we do not follow the fashionable and glamorous trends as much as we do follow the values of offering a special product, with a story and affection. Our company has very striking values behind its clothes, and fashion should take that path more often. Our experience in Vietnam gave us the opportunity of finding real beauty, not just superficial one. We consider ourselves exclusive, but in the sense that our garments are limited because they are particular and special, they have a meaning, a background. I always put the same example: when you see a person dressed glamorously you think “She looks stunning and elegant”, but you step back. At Chula we want people to step forward, to mingle. Our clothes are telling a story, reflecting your personality, speaking about an ethnic minority that makes clothes in a determined way, saying something about your favorite city, or animal. There are a lot of subjects within our clothes. They are bright and vivid clothes that invite you to have a conversation. When you are at a party, a bit shy, and you see someone dressed by Chula, it should give you the confidence to come close, to mingle. Which is Chula’s aesthetic proposal? Thank you Laura for really connecting with Alawa, where we also seek to promote this everlasting beauty that does not reflect in temporary things but that leads us to the beauty that lies in each person’s life. Beauty which exists in your life, in your family’s life and in your business’ life too. We are here to share this with you, always. L: Thanks a lot! I was deeply moved when I heard about Alawa, as I see all the resemblances with Chula: a vital, very professional project, that seeks to find interior beauty and that it’s run by a couple.